Hello and happy Friday! Boy has this week ever flown by! Today I have a project for the current Peachy Keen Challenge to share with you. I started working on this some time ago, and decided to finish it out as a piece for Thanksgiving decoration. For Peachy Keen Challenge 42, we are challenged to create a 3-D item that can be used as wall art. Since I LOVE working with the Peachy Picks Kit, and wanted a Thanksgiving theme, the paper from this month's kit couldn't have worked better. I started by covering the slats on this unfinished pine wall hanging with some pretty patterned paper from the Peachy Picks Kit. I embellished with paper raffia, and pom-pom trim that was included in the kit, as well as the beautiful button assortment. The sweet Thanksgiving prayer and adorable little birds are all a part of the PK-141 Lil' Tweets Thanksgiving stamp set. The SVG files that go with this set are VERY handy and save all the fussy hand cutting. What a time saver!! I sponged the edges of the birds, sentiment, and the wall hanging itself with Tim Holtz distress ink in vintage photo. LOVE that stuff!!! 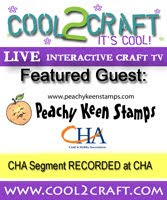 My design team sisters have created some REALLY wonderful things for this challenge, so please be sure to drop by The Peachy Keen Challenge Blog to see their creations, and please do visit their blogs and leave them some love. We all love to hear from you! Thanks for stopping by today. Have a FABULOUS Friday, and an even more fabulous weekend! Wishing you many happy blessings and lots of happy stamping! This is a beautiful creation! TFS and inspiring! Oh, how sweet, Lori! So clever to use the pine wall hanging for the project. Of course I love the birds but the buttons and prayer and bow are really special too. Great job! What a GORGEOUS wall hanging Lori! I love the fall colors and adorable PKS!! Thanks for the inspiration and for sharing another awesome project! Lorie, this is just super cute for the Thanksgiving season. Very sweet! We used to say that prayer at snack time when I was a preschool teacher. Good memories! Absolutely amazing creation! I love the design and your creativity! So very sweet and adorable. Great project! Oh my Lorie... those little birdies are so cute!!! and I LOVE that sentiment. My little son used to say that prayer at preschool!!!. So cute!!! Well, Lorie you have done it again!!!! NOw I want the Peachy Keen Paper packs!!! !